The Hackensack River is a river, approximately 45 miles (72 km) long, in the U.S. states of New York and New Jersey, emptying into Newark Bay, a back chamber of New York Harbor. The watershed of the river includes part of the suburban area outside New York City just west of the lower Hudson River, which it roughly parallels, separated from it by the New Jersey Palisades. It also flows through and drains the New Jersey Meadowlands. The lower river, which is navigable as far as the city of Hackensack, is heavily industrialized and forms a commercial extension of Newark Bay. Once believed to be among the most polluted water courses in the United States, it staged a modest revival by the late 2000s. The Hackensack River rises in southeastern New York, in Rockland County, in the Sweet Swamp, just west of the Hudson River and approximately 1 mi (1.6 km) south of West Haverstraw. It flows briefly southeast, into the Lake DeForest reservoir, separated from the Hudson by less than 3 mi (5 km). South of the dam, it then flows south, diverging from the Hudson. Just across the New Jersey state line, in northern Bergen County, it is impounded to form the reservoir Lake Tappan near River Vale. South of Lake Tappan, it flows in a meandering course southward through the suburban communities of New Jersey. Near Oradell, it is impounded to form Oradell Reservoir, where it is joined by several streams, including the Dwars Kill, the Cherry Brook and Pascack Brook. Van Buskirk Island, a man-made island and site of the New Milford Plant of the Hackensack Water Company, lies in this area. South of the reservoir, it flows past River Edge, Hackensack, Teaneck, Bogota, and Ridgefield Park, once again approaching within 3 mi (5 km) of the Hudson, and separated from it by the ridge of the Palisades. At Little Ferry, it is joined by the broad Overpeck Creek, then flows southward, widening in a broad meandering tidal estuary through the Meadowlands, forming extensive side streams and wetlands. South of North Bergen, it forms the boundary between Bergen County to the west and Hudson County to the east. Opposite Secaucus it is joined by Berrys Creek, then flows past the western edge of Jersey City, which overlooks the river's valley from the ridge of the Palisades, before forming Newark Bay at its confluence with the Passaic River between Jersey City and Kearny. As it flows through the Meadowlands it is traversed by numerous rail and road bridges. The name of the river comes from the Lenape word Achinigeu-hach, or Ackingsah-sack, meaning flat confluence of streams or stony ground. Conflicts with the Lenape prevented the early Dutch settlers of the New Netherland colony from expanding westward into the valley into late in the 17th century. The river furnished both the Native Americans and the European settlers with abundant runs of herring, shad and striped bass. In the colonial era, the river and the surrounding Meadowlands presented a formidable difficulty in transportation and communication. The wetlands helped allow the escape of the Continental Army under George Washington in 1776 after several defeats at the hands of the British army on the east side of the Hudson. It later served as a protective barrier that allowed Washington's army to encamp in the nearby hills near Morristown. For two centuries, the river suffered from extremely severe pollution. The construction of the Oradell Reservoir dam in 1921 essentially changed the lower river from a free-flowing stream into a brackish estuary, allowing the encroachment of marine species. Urbanization in the region intensified after World War II, with the expansion of roads and highways, including the New Jersey Turnpike (1952), as well as the Meadowlands Sports Complex (1970s). By the 1960s, much of the lower river was essentially a turbid hypoxic dead zone, with only the hardiest of species, such as the mummichog, able to survive in its waters. Chemical companies dumped large volumes of waste into Berry's Creek during the 20th century, resulting in the highest concentrations of methyl mercury of any fresh-water sediment in the world, as well as extensive residues of PCBs and other chemicals. Three sites along the creek are federally-designated Superfund sites and require major cleanup operations, which are ongoing as of 2019. The river recovered somewhat by the late 2000s following the decline in manufacturing in the area, as well as from enforcement of Clean Water Act regulations and from the efforts of local conservancy groups. Recreational fishing has staged a modest comeback, although catch and release may be advisable, as there are continuing health advisories against the consumption of fish caught in the river. Urban runoff pollution, municipal sewage discharges from sanitary sewer overflows and combined sewer overflows, and runoff from hazardous waste sites continue to impair the river's water quality. The future of the wetlands around the lower river has been an ongoing controversy between development and preservation groups in recent decades. The Hackensack Meadowlands Development Commission, later called the New Jersey Meadowlands Commission, was established by the state in 1968 to manage development and habitat preservation. The commission was merged into the New Jersey Sports and Exposition Authority in 2015. ^ State Dept. of Envtl. Prot. v. Ventron Corp. , 94 NJ 473 (Supreme Court of New Jersey 1983). ^ "Berry's Creek/Berry's Creek Canal". Meadowlands Environmental Site Investigation Compilation. U.S. Army Corps of Engineers, New York District. May 2004. ^ "Scientific Chemical Processing Superfund Site". Superfund. New York, NY: U.S. Environmental Protection Agency (EPA). 2018-10-23. ^ "Universal Oil Products Superfund Site". Superfund. EPA. 2018-10-23. ^ "Ventron/Velsicol, Wood Ridge Borough, NJ: Cleanup Activities". Superfund. EPA. Retrieved 2019-01-14. ^ "Newark Bay Complex (including Newark Bay, tidal Hackensack River, Arthur Kill, Kill Van Kull and tidal tributaries)". Fish Smart Eat Smart NJ. Trenton, NJ: New Jersey Department of Environmental Protection (NJDEP). 2018. ^ "Watershed Management Area 5 Factsheet" (PDF). NJDEP. 2007-07-17. Archived from the original (PDF) on 2009-03-27. ^ New Jersey Meadowlands Commission, Lyndhurst, NJ. "Wetlands Sites in the Meadowlands." Archived 2011-07-21 at the Wayback Machine Accessed 2009-02-27. ^ "Christie signs controversial Meadowlands overhaul, but says bill will be revised". 5 February 2015. 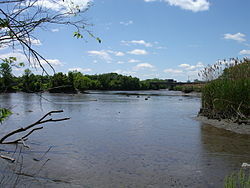 Wikimedia Commons has media related to Hackensack River.